Polite and efficient valet service available nightly. Enjoy live music in our upstairs lounge on Friday and Saturday nights. For over 45 years, we've prided ourselves on consistently creating legendary experiences for all our guests. 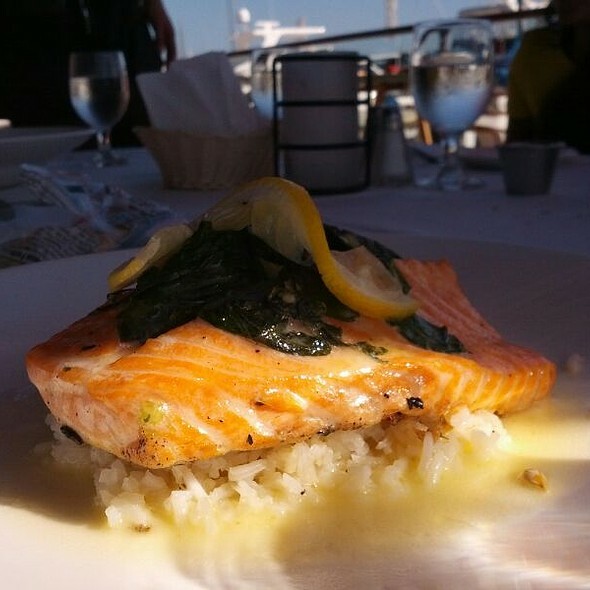 From our signature fresh fish to our spectacular waterfront views, we hope you savor each and every moment. For an enhanced experience, ask one of our experts to pair our handcrafted cocktails, craft beers and selections from our award-winning wine list. Relax on the patio and enjoy FRESH FISH TACOS paired with one of our famous margaritas! Thank you for celebrating Mother's Day with us! We are offering a special menu for this holiday and it is $35 per person with a 3 course meal included. Skip the tie! Treat pops to a CREEKSTONE RANCH BONE IN RIBEYE, 16 oz. Certified Black Angus, High Quality grass-based feed, Yukon gold garlic mashed potatoes, watercress! I’m hoping our experience was due to Saturday night volume - but... it started with our drinks at the bar - the special mai tai was undrinkable. The garlic bread should have been called cheesy bread, we didn’t taste the garlic. The goat cheese soufflé was dense & cold. The crab cakes had shells & the calamari was beer battered & arrived after all the appetizers were finished. And at the end of our meal our check with credit card got lost & took over 15 min to leave. Only come for the view. Food was great and the view spectacular. 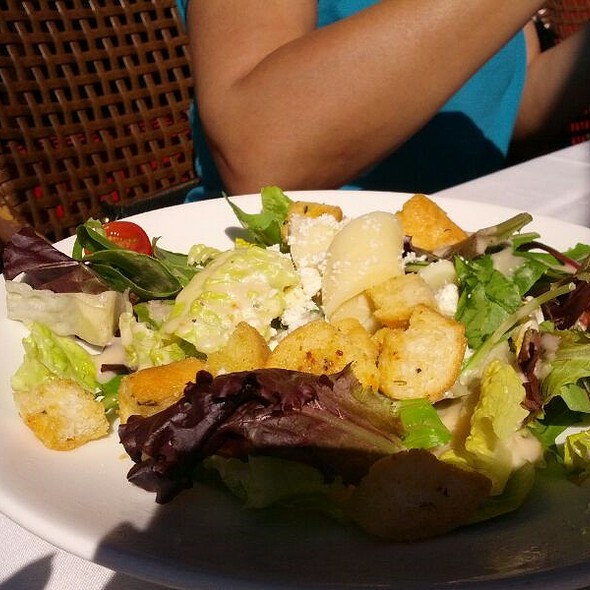 Rusty Pelican is our go-to restaurant when meeting friends and one of our favorite places to eat! Today was awesome as always! Wouldn't change anything. This was our friends first time and they were extremely happy we introduced them to R.P. What a great place to eat! Amazing garlic bread - fantastic goat cheese soufflé and those were just our appetizers. 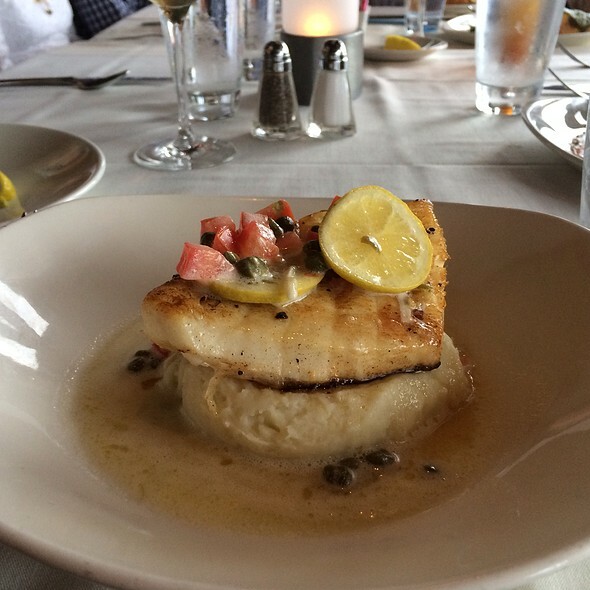 I had the fish special which was a delicious sautéed halibut with a lemon beurre Blanc sauce with capers. 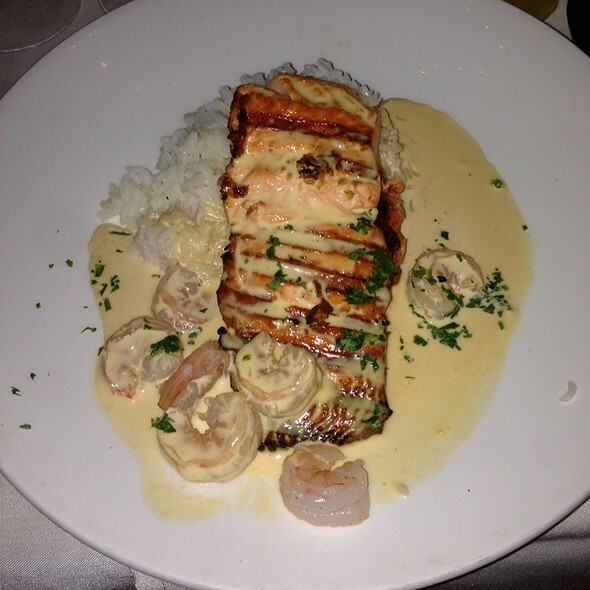 My husband and daughter also had different fish entrées that they really enjoyed. The service was so good we never wanted for anything. We sat outside on the deck and were given blankets because it was a cool evening and it was a wonderful cozy meal. The view, the ambience, the food, the service - you can't go wrong! The Alaskan king crab legs are always a favorite. This time we also discovered their happy hour menu upstairs in the bar before dining. $3 garlic bread and $5 calamari! These are two of the best appetizers on the menu. Highly recommend for any event from a special occasion to a night out with friends. Delay with the reservation: it was for 6.30 PM, the table was ready by 6.50 PM and while we were waiting for our table at least 3 parties of an equal number of people were directed to their table. Only when I asked politely if there was something wrong with my reservation I was finally seated... I suspect that customers with a long history were given the nicer tables... Other than that, the restaurant was fine, food was delicious and service at the table was ok. The staff was very attentive and gave us privacy - loved that. Food was prepared as promised. Wish their parking lot was bigger. We were a but late for our reservation because the lot was full and we had to find parking and then walk back to the restaurant. Our server was fantastic. She had way too many tables to be able to provide the service she wanted to provide. She always had a smile and provided great conversation. My wife and I both enjoyed our meals very much. Presentation, preparation, and taste. Selfishly I wish my portion could of been a little larger. Our server Linda did an excellent job at explaining the menu options. The view of the marina was beautiful as well. Crab cake Benedict had shell pieces. Six of the seven dishes we ordered came to our table at room temperature. Service was not attentive, staff was not really personable or paying attention to details. This is one of those places where it had been the same place forever, extremely popular. Decent good food and great view of the water. We were sit on the second level (bar level with partial table sections.). The only thing we do not like is the band coming on at 7PM. Its extremely loud where it kills opportunity for any conversation. If the management can move that to 9PM to allow dinners who does not want the live music to be able to enjoy the meal and conversation more. Wife's birthday, so everything had to go great, and it did. Justine was superb as our server, the food was very good and the prices fair. I asked for a "view table" and we were seated with a magnificent few of the waterway. All was outstanding and we enjoyed our evening very much. We'll be back. Nice place, good foods, good services and good price! Celebrated our Anniversary at our Favorite place! Couldn’t have been better! Excellent food,service, and location! 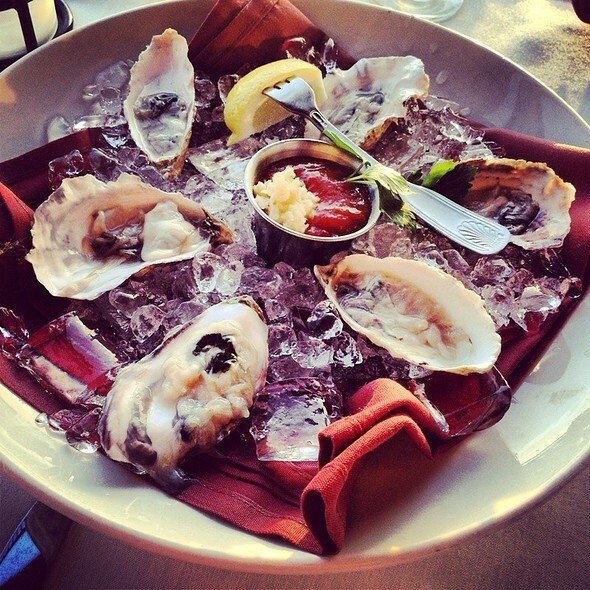 We love Rusty Pelican! Excellant services from reception desk to waiters. We try to visit the Rusty Pelican whenever we're in So Cal. This time it happened to be our 20th anniversary. I mentioned that in the reservation, and was surprised to have even the hostess congratulate us. The food as always was excellent (I used to go to the Rusty Pelican in Cupertino, CA decades ago, and it's still the same great quality. Also, the portions were very good; we both got fairly large pieces of salmon, which they cooked perfectly (as soon as it starts flaking pull it off the heat). Staff was great, the sunset was great. Rusty Pelican never disappoints. So sweet and thoughtful. And always 1 step ahead of us - which was great!!! 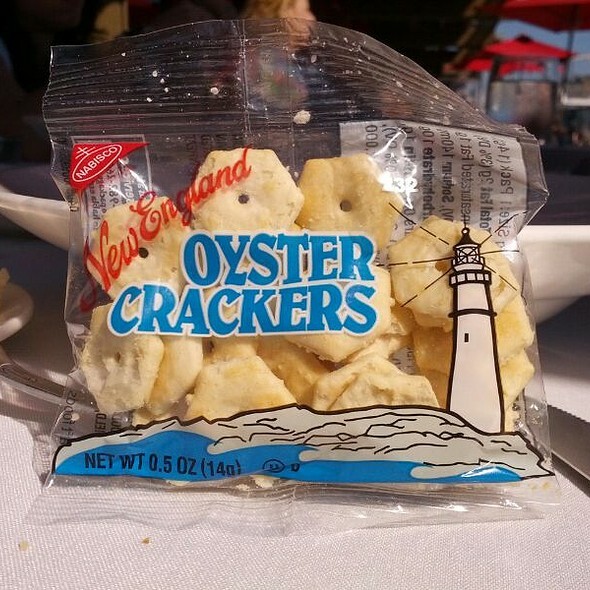 Very good food & service with a terrific bay view. 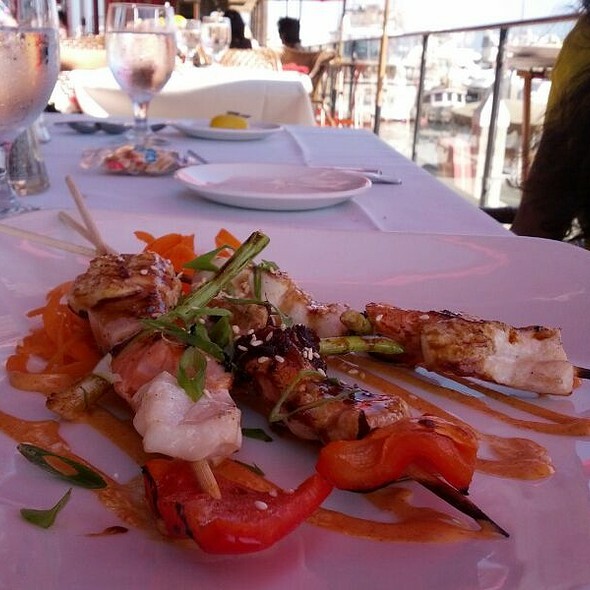 My family and I enjoyed the calamari appetizer, as well as grilled swordfish, orange mahi Maui, and fillet mignon. The waiter was most attentive, and we had an enjoyable dinner. Prices are high, but reasonable for the waterfront setting. As always everything was perfect. Great restaurant. Everything was great and I would have given 4 - 5 stars if it weren’t for making a 7:45pm reservation and they didn’t seat us until 9:00pm. They did wave corkage fee and comped appetizers and a round of drinks which made things better. It’s a popular restaurant and be prepared to wait even with reservations. The Filet was perfectly cooked! We got to sit next to the fireplace and look into the harbor, it was beautiful. We had to wait a little past our reservation time, but they were very busy and accommodated us as quickly as possible. 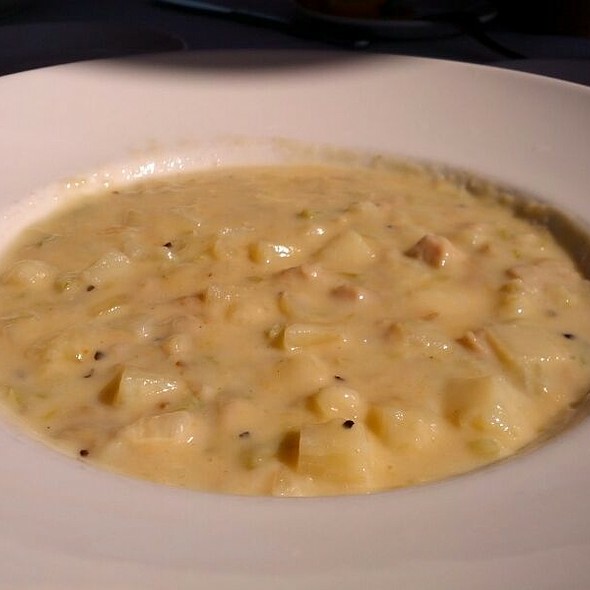 My fiance and I came out for our birthday dinners (4/3 & 4/5) and started with the calamari and the New England clam chowder. She thought the chowder was too thick but I thought it was great. The calamari fried batter was thick and heavy on the fried side but the calamari itself was perfect and not chewy in the slightest. We both had the Alaskan Halibut on an orange reduction sauce topped with tomato jam and served with heirloom beets and fennel because it sounded spectacular and we knew we didn't want to share! The dish exceeded our expectations and was cooked perfectly. Kudos for making such a unique dish! For dessert we both were served warm chocolate tartes with vanilla bean ice cream (Thank you, Rusty Pelican) and they were perfect. Great meal and service from start to finish. The view was great but unfortunately since there were two of us we were seated away from the window. The ambience is nice. My fish was undercooked but my companion liked her shrimp. The garlic bread was amazing. The service was good. Kristin our server very friendly recommended some great dishes not on menu, she came to our table at least 6or7 x to see if we needed anything was aware of refill drinks. The ambiance was wonderful. Thanks for making my husband 59th birthday so pleasant and thanks for the free desert. Will highly recommend it. I've been here twice already and will return back. We've been going to Rusty Pelican for years and for the first time I had something I didn't like. I ordered the special of the day, Alaskan Halibut. The fish was a little dry and pretty much flavorless. It came with a tomato jam on top which was way too sweet. Surprising really! We've always loved their food. The food and service were outstanding. Either sit on the deck outside or near the window and enjoy the sunset. Don't miss out on their garlic bread. Their fish is served in specialty dishes or simply grilled. Paired with the heirloom beet and arugula , the perfect meal. We were visiting from out of town and wanted to try something local. Not what we were looking for. Charge you for valet. Parking yourself is not an option. We had lunch Monday at the Rusty Pelican in Newport Beach, and as usual, the service was excellent and the food was phenomenal! Our family usually meets up here for lunch about once a month. 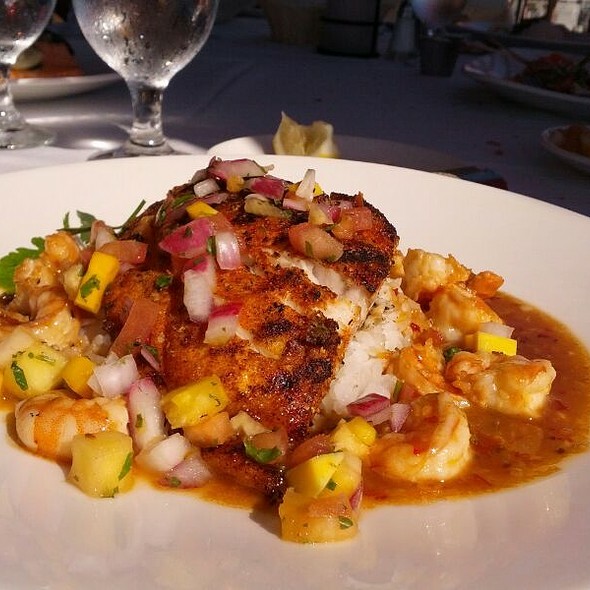 We always talk about trying somewhere else, but we just can't get past the fresh fish and wonderful people. I would highly recommend the Rusty Pelican to anyone who is looking for ambience, service, and great food. Food and service are consistently great. Love coming here when I’m in town. Great location, Great Food, Great service. The service nor food was great. He charged me the wrong amount. He had to go back to fix it, then this morning I was checking my account he charged my card twice. I will not be returning to this restaurant. My experience was not good at all. Very disappointed. The presentation of the food for the LOBSTER RISOTTO Maine Lobster, Snow Peas and Carrots was obnoxious. The rice looks too mushy, and it was not tasty. I paid all that money and the food was not appetizing. The waiter served us, however not to the expectation that I would have wanted that he provided to the couple next to us because he gave them better service and it was noticeable. We were six people (4 adults and 2 kids). We had a reservation for 5:30 pm on a Thursday night. Upon arrival we were seated immediately and got a table next to the window with a great view. That was most likely the best part of the experience. After a while our waitress came, asked for drinks and tried to sell me the Landry’s Club Card. We picked a bottle of white wine and were then told that they were out of it. We then selected a bottle of Rose. It came without a cooler. We were told that the wine cooler would arrive soon. When it arrived the bottle was basically empty. My wife and I were interested in the Ahi dish. Our waitress informed us that they were out of Ahi (after she told us earlier that they get fresh fish every day). So they were out by 6 pm? Something does not add up. So we all ordered our main dishes. As appetizers we had the Garlic bread and some fish. Those appetizers came out in a timely fashion and were good. It took a long time for our main dishes to arrive (not sure why). The good news is that the kids dinners came out quickly so that they had something to eat. The main dishes were good. We then ordered dessert. It also took long for the dessert to arrive. Same with the check. The whole dinner was about two hours which seemed to be quite long for what we had. The restaurant was not that crowded. Overall, the experience was okay, but we had much better dinners at this restaurant. Perfect, as always. As for service, It’s like being at a good friend’s beach house. You can’t get better fish and hard to beat the view. And they always accommodate my “special” dietary needs.